Hand Wrapping isn't for cushioning the hands. That's the role of a glove or hand protective equipment. Wrapping's role is one of support - to secure loose joints and moveable bones to limit possible injury, particularly of the knuckles, long bones along the back of the hand, and other small bones, especially in the wrist. Wrapping helps distribute the shock of impact across the entire hand and wrist. This also helps limit strains or tears of the ligaments that connect the bones of the hand. Skin too is protected from bruising or tearing. "When properly wrapped, as fingers close into a fist, the hand tightens into a solid, unified unit." The fact that your wrap doesn't mean you can't break bones or injure your hand upon impact. It only minimizes the possibility. Correct bone alignment is important and if you hit incorrectly, chances increase that your hand will suffer as much as your opponent when they connect. Below you will see a video of the method taught by my boxing trainer "Gato" Figueroa (featured numerous times on ESPN2 and HBO fights and formerly ranked 4th in the world as Light Welterweight). He is a great technician. 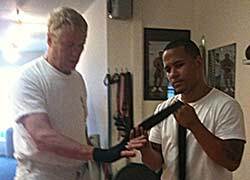 Christopher Caile having his hands wrapped by his boxing trainer "Gato" Figueroa before a training session. While Gato wraps my left hand I had a fellow boxer hold my iPhone for this video. It's not perfect, but you can follow the wrapping method. You might also hear music in the background. It's was playing at the time we took the video in the Morris Park Boxing Gym where I train (in the Bronx, NY).